General Louis Botha’s Government took office on 31 May 1910 in the sunshine of Imperial approval, and dedicated to conciliation between Briton and Boer. The ministry contained almost as many British as Dutch names. In choosing it, Botha had drawn carefully from all provinces. Because of the manoeuvrings which had preceded his own appointment and the pressure inside his own party for the spoils of office, Botha could neither abandon party lines and choose a ministry of all the talents, nor divide the nation along lines which he would probably have preferred — with Jameson and the Unionists on the government benches, and Hertzog in opposition. This was ironic, for when the electorate went to the polls in September 1910 the policies of the South African and Unionist parties were difficult to distinguish. 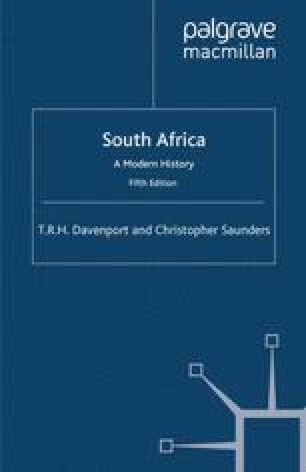 As Thompson has noted, both stressed the idea of a single South African nation (white by implication), both professed a non-doctrinaire native policy, both wanted white but not Asian immigration, material development, and Imperial preference, and neither sought special protection for the Afrikaner. Both hoped, in effect, that the spirit of tolerance would continue to grow in an atmosphere of ethnic peace. Problems arising from the relationship between blacks and whites did not appear to cloud the scene, for all save a few discerning thinkers like Abdullah Abdurahman, Olive Schreiner and M. K. Gandhi were inclined to leave these for the broader shoulders of the future.